Food Photography: 2016 year in review. Every year I try to make a blog post that includes my favorite images and projects from the previous year. I would like to keep my blog more up to date, but sometimes I have trouble posting current work because I would like for my clients to use the images before I make a post. I usually end up moving on to other projects and forgetting to write about the excitement from each photo shoot until it’s far too late. I had several fun projects last year that included photographing food, which is one of my favorite things to do. I shoot both editorially and commercially, and I love the variety of images I created this year because each client presented me with a “look” that I had to achieve to fit their need. Here are some of those images, and a few behind the scenes photos from the shoots. 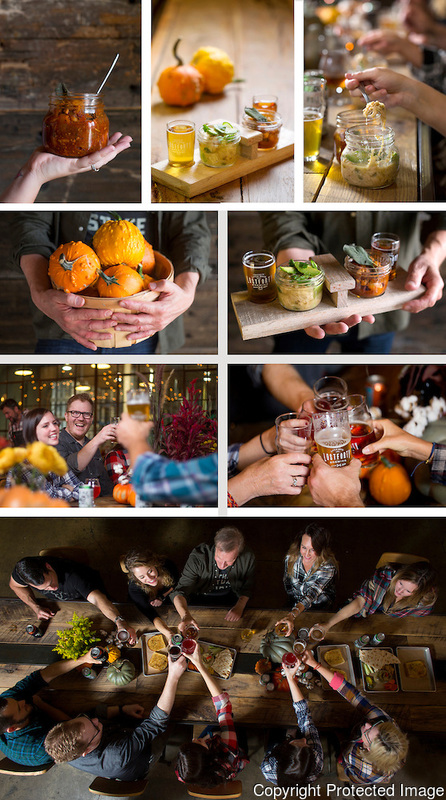 I photographed a white bean chili cookoff at the Lost Forty in Little Rock for P. Allen Smith’s e-magazine, Naturally. The location was wonderful, but there wasn’t much available light and I was asked to make the shoot look moody. I set up a couple of lights and worked angles around the table to try to balance the artificial lighting with what was available. It was a fun shoot because of this challenge, and I love having to think and create on the spot. Lots of fun was had as the “models” ate and drank around a beautifully decorated table. I also photographed food for an article on Bentonville for the New York Times. This presented another challenge in lighting as I tried to match the mood of the light on the food with the mood of the light in the restaurant. I really like lighting my work so for this assignment, I challenged myself to shoot only available light. To some photographers this probably seems like a funny challenge, but over the years I have really gotten away from shooting what is there because I want to control the light… it was a fun challenge for 2016. The first restaurant I visited was Oven& Tap just off the square in downtown Bentonville, Arkansas. It’s very bright and modern, with a lot of natural wood, so I tried to use those elements in the photographs I created. I also visited Bentonville Brewing Company, which has the kind of mixed light you can expect from a bar. I also visited Tusk and Trotter, which has a dark and moody atmosphere. There aren’t many windows, so I had fun using the beam of light that illuminated a table to create darker images of the beautiful food. The light in the images, especially the last one, reminds me a little bit of the painters I studied in college from the Dutch Golden Age. Light is photography, and I always try to push myself to create new looks and expand my skill-set as a photographer. Sometimes I challenge myself, and other times I am challenged by my client. The next set of photos are of products for a client’s fall catalogue. I was asked to take photos on a white background, and also to create scenes using the products. Seems pretty simple until they mentioned that we would be shooting in a warehouse with no windows, and they wanted natural light. I thought quite a bit about this shoot, did quite a bit of googling, and finally came up with a solution while wandering through Wal-Mart looking for a solution. I walked down the bath isle, saw a frosted shower curtain and thought it would work best to spread the light evenly. While setting up in the warehouse, I got a few stares from employees but I think it ended up working out. Here’s a behind the scenes look at the setup followed by images from the shoot. I’m always amazed at how much stuff I can fit in my car for a photo shoot. Have studio, will travel! Some BTS of the stylist laying out and prepping food. We created their logo in food to use in the catalogue and also as a facebook banner. Another notable shoot in 2016 was for George’s Chicken in Springdale, Ark. I work with a wonderful team including an amazing food stylist, and we always have such a fun time working together. It’s hard to work around fried chicken all day and not eat it, but somehow we managed. These images will be used for retail packaging and also for advertising and marketing. One of the best parts of being a food photographer is being able to taste test following the shoot. I worked with a couple of local restaurants this year to create imagery for their new menus and also for social media. I lost count of how many dishes we photographed, but below are some of my favorites from Hello Ninja in Rogers, Ark. I will end with a few random food photos taken for editorial clients including a collage of images of vegetables taken at P. Allen Smith’s Moss Mountain Farm in Roland, Arkansas. We have to end with a photo of the best assistant, Meg, who will do almost anything I ask, including holding plates of food while we drive to a nearby park for part 2 of a shoot. Newer Post Product Photography: 2016 Year in Review	Older Post One of the many reason I love being a freelance photographer in Arkansas.